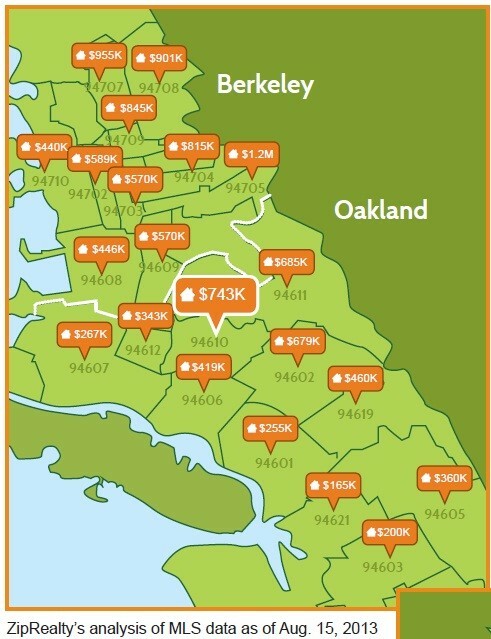 The median home sales price in Oakland skyrocketed a whopping 76 percent over the last year, according to newly released data from ZipRealty, a local real estate firm. 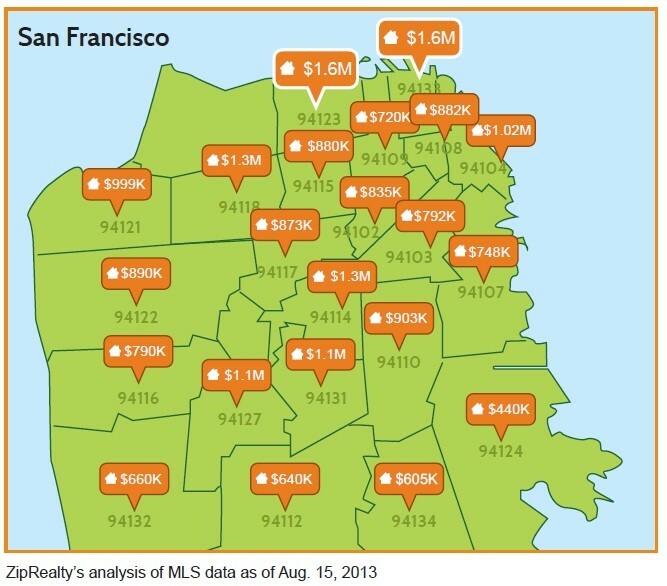 The price shot up from $245,000 in mid-August of 2012 to $432,000 in mid-August of 2013. Homes are going quicker, too. As of August 15 of this year, median days on the market were 13 compared to 19 the previous year in Oakland. The rate of the increase in Oakland largely surpasses the jumps in San Francisco and the Bay Area in general. More details and graphs below. "You can see it in our search traffic. People are starting to look out of San Francisco and to the East Bay," Lanny Baker, the company's CEO, tells the Express. Here's a chart from ZipRealty that outlines the key stats (click for larger version). The increase in San Francisco was 20 percent to $880,000 as of mid-August, and the nine-county Bay Area median price rose 36 percent to $585,000. The company notes that Oakland and other East Bay communities were impacted more severely by the foreclosure crisis, which affected real estate values here and set the area up for dramatic recovery in prices. And there are a range of other factors to consider, including the relative number of homes on the market. Still, Baker says a 76 percent increase is pretty unique. "San Francisco buyers come here and have entered the Oakland market with much higher comfort zones," he says. "That's propelled Oakland prices up quickly. In percentage gains, it's enormous." Because San Francisco prices did not fall as hard during the downturn, Baker notes, the upswing in the East Bay is relatively huge, even if prices here are still much more affordable. "I do expect Oakland to continue to be strong," he says. "We're entering what feels to us and looks like to us a very sustainable recovery." If you're curious, the report says the most expensive zip code in Oakland is 94610, where the median home price was $743,000 as of August, giving the area a 130 percent increase from the previous year. That area includes Grand Lake, Adams Point, Lakeshore, Crocker Highlands, and Trestle Glen neighborhoods.